Verizon and T-Mobile restarted offering unlimited plans after several years of intentionally avoiding them and now AT&T also jumped the bandwagon of the “Unlimited Data Plan”. The latter introduced an offer for its consumers that provides 10GB tethering/line, HD video streaming and various incentives such as monthly credit towards DirecTV and zero-rating when watching DirecTV Now on your smartphone. 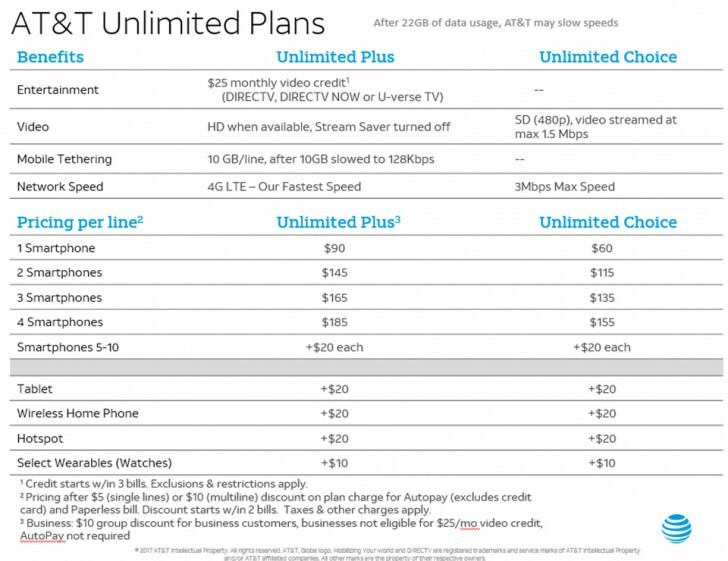 The Unlimited Plus plan offers unlimited data on the AT&T's 4G LTE network for $90 for one phone line. Adding other devices costs extra, but the carrier gives various incentives if you do add more lines. For example, DirecTV, part of the AT&T portfolio, is available with zero-rating. This means you can watch DirecTV on your mobile phone without spending your data allowance. And there is a limit to keep trakc of even though the plan is called Unlimited. The plans has a fair usage data limit of 22GB per line. The conditions of AT&T's Unlimited plans allow for up to 10GB of mobile tethering per line. If $90/month is too much for you, there’s also the Unlimited Choice for just $60. If you go that route, the network speed is capped at 3Mbps instead of taking advantage of the full 4G LTE speed, and you can stream video only in 480p with a max speed of 1.5 Mbps. Choose it wisely man we always have a choice. 22 Gb, 10 Gb, is NOT "unlimited"! "unlimited" = NO limits at all!